Jordan Hindson examines Dr. Strangelove and the Cuban Missile Crisis to reflect on the twisted logic that frames the nuclear debate. The U.S.-Soviet relationship, during the years of the Cold War, narrowly avoided collapse in October 1962. Revolutionaries in Cuba toppled the dictator, Fulgencio Batista, in the 1959 uprising led by Fidel Castro and his less moderate brother, Raúl – and all of this in Uncle Sam’s very backyard. Castro and his cadre flirted between cosying up to Moscow (both Raúl and Che Guevara, handsome icon of the revolution, whose photograph has since adorned the walls of many a student revolutionary, were already members of the Communist Party of Cuba) and maintaining the faint semblance of a relationship with Washington. They feared – most justifiably – a repeat of the 1954 Guatemalan coup d’état, in which the CIA cynically ousted and overthrew the democratically elected president, Jacobo Árbenz. 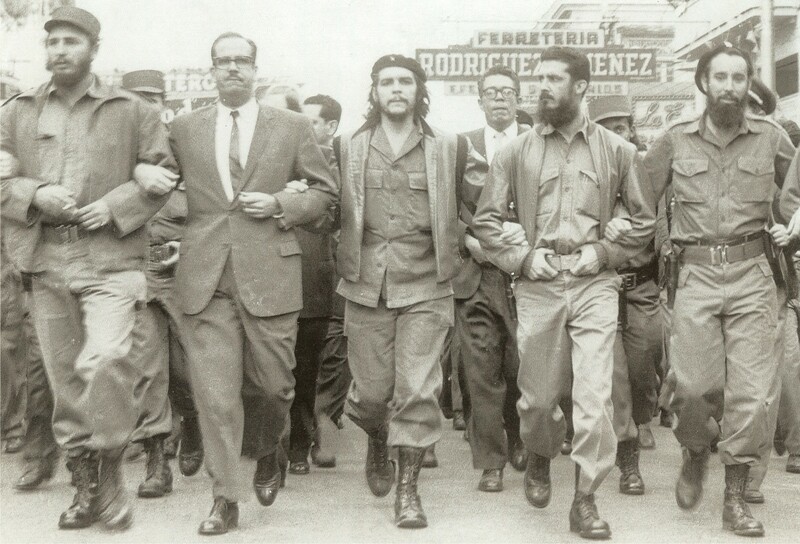 Che Guvara at a march in Havana, 1960, to mourn the La Coubre explosion, a CIA operation which killed up to 100 Cubans. After much surveillance and covert aggression from first the Eisenhower and then the Kennedy administration, Soviet premier Nikita Khrushchev installed nuclear-armed missiles on the beaches of Cuba in order to combat any further threats of invasion from America (particularly after the 1961 Bay of Pigs fiasco) and draw attention to America’s own – hypocritical – positioning of missiles in Turkey, pointed at Russia. The whole frightful story, in which Kennedy and Khrushchev gambled the lives of everyone in the northern hemisphere in a game of chicken, is expertly told in Aleksandr Fursenko and Timothy Naftali’s magisterial, aptly named study, One Hell of a Gamble. Two years before the crisis, Herman Khan published On Thermonuclear War. Khan belonged to the set of Cold War intellectuals who took it upon themselves to do the hard thinking about nuclear genocide. On Thermonuclear War contained mordant and morbid discussions of the gory consequences of a nuclear exchange, and offered advice to governments hoping to avoid such crises as that which would terrify the world in 1962. The greatest cinematic illustration of the burgeoning field of apocalyptic scholarship is Stanley Kubrick’s Dr. Strangelove. Even in an age already petrified by the possibility of nuclear catastrophe, Kubrick was unusually sensitive to the threat; reading Khan’s book confirmed his desire to make a movie on the subject. Initially intent upon creating a serious film, Kubrick soon realised that only the genres of farce and black comedy could come close to accurately capturing the logical inconsistencies and paradoxes that formulate the nuclear debate. In Dr Strangelove, Sterling Hayden plays Jack D. Ripper a mad, paranoid general, whose concern that the Russians are adding fluorine to the water supply and polluting the “precious bodily fluids” of the American people prompts him to launch an unauthorised nuclear strike with the intention of annihilating Russia. A subordinate officer, Group Captain Lionel Mandrake (Peter Sellers), attempts to stop this act of madness, but not before Ripper puts the base on high alert and cuts all lines of communication. At the Pentagon, in the ‘War Room’, President Merkin Muffley (Sellers again) and his war cabinet debate how to respond to Ripper’s actions. General Buck Turgidson (George C. Scott) acts as jingoistic warmonger throughout the debate; in a strong field, he is arguably the most amusing character. President Muffley phones the (drunk) Russian premier, only to be told that Russia has recently developed a ‘doomsday device’. Kubrick got the idea for this contraption from Herman Khan; it will, upon detection of an American nuclear strike, detonate automatically, destroying the entire planet. Intended as the ultimate deterrent, the Russians, crucially, failed to tell anyone about it. Only in the already warped and distorted context of the nuclear debate could a device with the power to wreak such devastation be seriously considered as a ‘deterrent’ to further devastation. Comic logic at an apocalyptic level. Panic ensues, as the 843rd Bomb Wing continues to fly towards its target. A technological hitch gives way to one of the most famous images in cinematic history, that of Major T.J. “King” Kong (Slim Pickens) straddling the bomb as it delivers the killing blow to planet Earth, our pale blue dot. The War Room turns to talk of survival strategies; we’re in Fallout territory now. 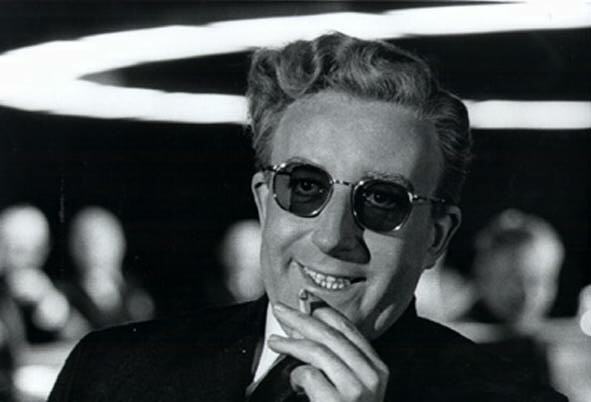 Enter the creepy and magnetising figure of Dr. Strangelove (Sellers once more; he is everywhere in this movie), a former Nazi scientist turned U.S. nuclear expert,. Strangelove revels in advising the President to make plans for the fittest of the human species (pseudo-Darwinian overtones inform the entire discussion of post-nuclear life). These superior specimens just so happen to include all government officials, who should hide away for a few decades in a deep mine shaft. Addressing the President as “Mein Fuhrer” might perhaps indicate that Dr. Strangelove’s postwar shift in patriotic allegiances has been neither swift nor complete. His errant and uncontrollable hand, which alternates between self-strangulation and the Nazi salute, analogises the fact that, however ‘coherent’ and uniform a government’s policy is, it only takes one faulty element – or one mad general – to bring about fire and blood and anguish. The ‘logical’ framework of the debate around apocalyptic weapons is uninterested in human nature. In a 2014 New Yorker article, provocatively titled “Almost everything in ‘Dr. Strangelove’ is true,” Eric Schlosser discusses the fact that the most unrealistic and outrageous scenes in the film have startling historical precedents. Schlosser affirms that not only is it true that junior U.S. officials were given, in certain circumstances, the authority to fire nuclear missiles without presidential authority, but also that the safety mechanisms on the weapons held in Europe were worryingly lax. It also transpires that one of the hovering real-life archetypes for the neurotic Dr. Strangelove was Wernher von Braun. Member of both the Nazi Party and the SS, and inventor of the V-2 rockets that crippled London toward the end of the war, he was later recruited by the U.S. to work on a ballistic missile program. This was part of the feebly named Operation Paperclip, which sought to assimilate German scientists into the technical departments of the U.S. Army. Von Braun would later go on to develop the Saturn V rocket that catapulted Neil Armstrong and co. to the moon in 1969. Here, Mark Twain’s claim that the truth is often stranger than fiction is proved correct. Richard Feynman, physicist extraordinaire who was at Los Alamos in the ‘40s and who helped develop the atomic bombs that obliterated Hiroshima and Nagasaki, related how, having returned to his normal life, he sat in a restaurant and imagined such a bomb being dropped on New York. He watched the construction of a bridge and despaired at the futility of creating anything at all, now that the weapons existed capable of destroying all the fruits of civilisation. History has shown that Feynman’s anomie need not have been quite so acute, but there have been moments, as in October 1962, when the tapes of the burning of Hiroshima and Nagasaki have almost found their sequel. 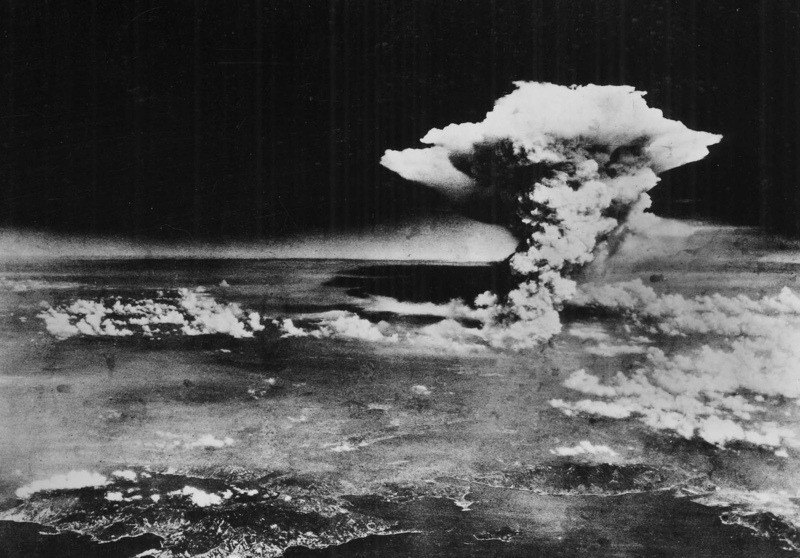 A similar strike would now be exponentially more damaging, for the atomic has given way to the hydrogen bomb; the technology behind nuclear genocide is always being fine-tuned. The astonishing public backlash against Jeremy Corbyn’s recent admission that suggested he would never press the nuclear button is a worrying sign of just how completely the existence of these weapons is taken for granted. Nuclear weapons have eroded the traditional division between combatant and citizen, putting us all in the front line. Only in the wonderland logic of the nuclear debate can a party leader be criticised for confessing that actually, no, he would not commit mass murder. These weapons will not remain in the shadows forever and, while they exist, there will always be the risk of Kubrick’s black comedy becoming a documentary. But then again, nobody would be around to watch it. Jordan Hindson is a third year student at the University of Warwick, studying Biomedical Sciences. He writes a regular column for the Warwick Globalist.